This recipe for Golden Punch was handwritten on an index card, mixed up in a modest collection of recipes (some dating back to the 1940s). It’s age is unknown. See more recipes from this collection! The original recipe has been scanned and is transcribed below. It can be printed for use in your own home kitchen. Enjoy! Please Note: Every effort has been made to transcribe these old recipe cards completely and accurately. Many have faded, are stained, or simply do not include every step or tool used in the process. We have changed the wording in some places and added instruction in others to make the text a bit clearer. We do not test or verify all the information found on these old cards. If you choose use the information found here, please know that you do so at your own risk. Combine juices, sugar and water in a large bowl. Let stand 30 minutes. When ready to serve, add ginger ale. Serving variation: Pour juice over ice in tall glass until 1/2 full. Fill to top with ginger ale. This recipe for Swiss Steak is a magazine or newspaper clipping that was glued to an index card. It was found in a small red metal recipe file box worn with age. 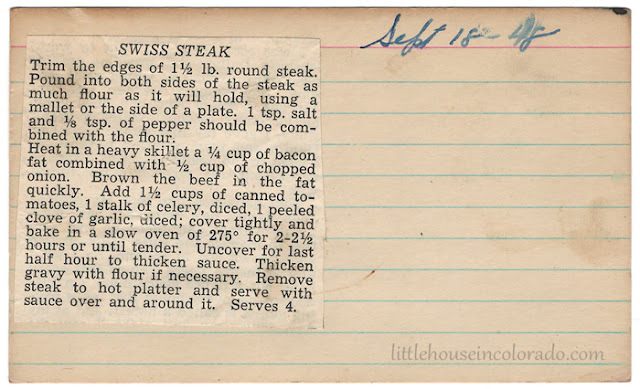 The recipe card is dated “Sept 18 – 48”. 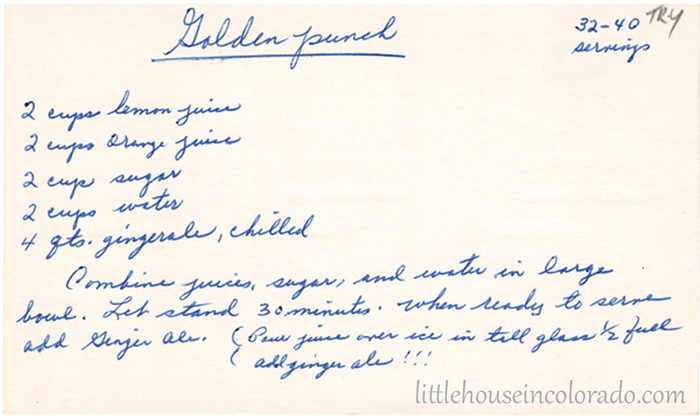 Please Note: Every effort has been made to transcribe these old recipe cards completely and accurately. Many have faded, are stained, or simply do not include every step or tool used in the process. We have changed the wording in some places and added instruction in others to make the text a bit clearer. We do not test or verify all the information found on these old cards. If you choose use the information found here, please know that you do so at your own risk. Trim the edges of round steak. Pound into both sides of the steak as much flour as it will hold, using a mallet or the side of a plate. 1 tsp. salt and 1/8 tsp pepper should be combined with the flour. Heat in a heavy skillet bacon fat and onion. Brown the beef in the fat quickly. Add tomatoes, celery and garlic. Cover tightly and bake in a slow oven of 275 degrees F for 2 to 2 1/2 hours or until tender. Uncover for last half hour to thicken sauce. Thicken gravy with flour if necessary. Remove steak to hot platter and serve over and around it.